The USS MAINE Memorial Bells! 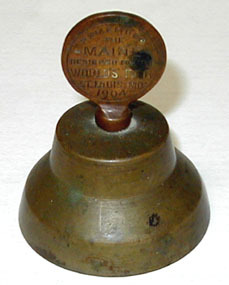 Another set of MAINE bells was produced in 1904 for the St. Louis World's Fair. These bells were also made from metal recovered from the wreck of the Battleship MAINE. The text on the handles read as follows. 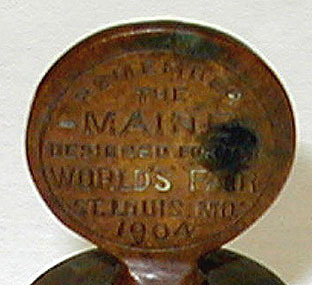 The front (below, left) reads "Remember the MAINE Designed for the World's Fair St. Louis, Mo. 1904." 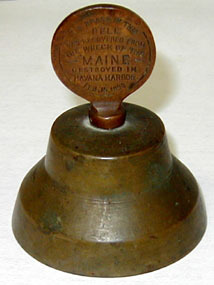 The back (below, right) reads "The brass in the bell was recovered from the wreck of the MAINE destroyed in Havana harbor Feb. 15, 1898"